Some people say that Lenin looks like Di Caprio. I bet they are related. Lenin visited island Capri in april 1908 to meet Maxim Gorky. It was the good one. Cool and pretty funny. I choke on my morning coffee, burst out lauthing. It made my day, and I left a record about this memorable website in my blog. And his first name he got in honor of Russian classic writer, Leo Tolstoy! :-). Well actually they really look very different. I now see Di Caprio eventually doing a Lenin biography. Leo Dicaprio is the grandson of Lenin. Yeah, his real name was Leninardo Di Caprio, but he changed it when he arrived to the United States XD. >1908 to meet Maxim Gorky. 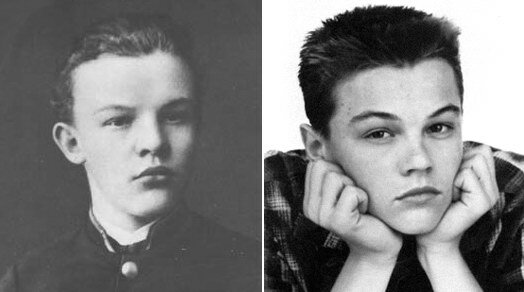 It’s unbelievable – so, di Caprio is a descendant of Uljanov (Lenin) and Maxim Gorky. Now, I understand why ‘modern’ leftis like so much gays. 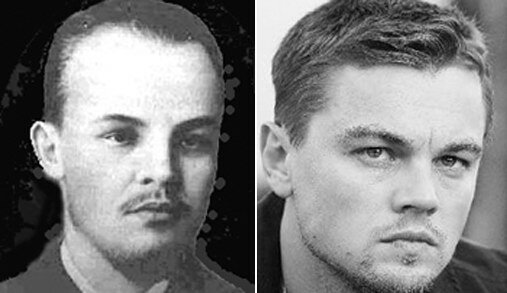 Leo Dicaprio is the clone of Lenin. The cells from Lenin body were taken in mausoleum, Moscow, by KGB. And Lenin was cloned in the labs of KGB. The clone-baby was given the name of Leonardo Di Caprio and sended to America. James Cameron is the agent of KGB and he made Leo an actor to give him popularity. KGB plans to make Leonardo Di Caprio the president of the USA as Ronald Reagan (he is also an actor). So that’s how KGB plans to build up Communism in the USA. Guys, I love your theories. I’m ROFL for the rest of the day now lol. Just to clarify: Little known fact- Leonardo DiCaprio looks like a German(period, because he is one, at least 3/4 of him). This is because Lenin does not look Slavic really at all. Lenin himself had much Swedish(proto-German) and German blood(also Mordovian, perhaps a bit Jewish etc). He was by no means more Slavic or Russian than other Northern European. 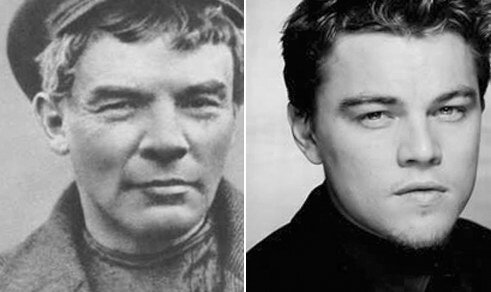 Long story short, DiCaprio does not look Slavic, at least not in an identifiable sense, and either does Lenin. But it is true, they both look a whole lot like each other. I noticed this the first time I saw some pictures of Lenin. It really is rather remarkable. lol, Dicaprio is pretty cool in his latest movie. I love Inception! It’s such a wild movie that I think it destroyed the chances for me to enjoy any other movie! ok now its time for leo to start world revolution in america. just stop with the dummy models first and join sean penn. ps: talk to damon, affleck, pitt, jolie, garner, olivia wilde, streep, tarantino, moore those might help you. Well, I don’t understand such comparasings at all!) Maybe something is simillar, so what? We all know that these people played very different roles in history. Hovewer, one of them could really play another in movie 🙂 Maybe it will deserve Oscar!